The Steelers’ final offensive play in their 27-24 loss to New England was exactly as chaotic as it looked. Normally, that’d be a good thing on a fake spike—you want to confuse the defense. But it would’ve been better for Pittsburgh if more than two Steelers knew what was going on. That’s right: The play, which resulted in a game-sealing interception, was not a fake spike—just a regular play that nine of 11 Steelers thought was going to be a spike. 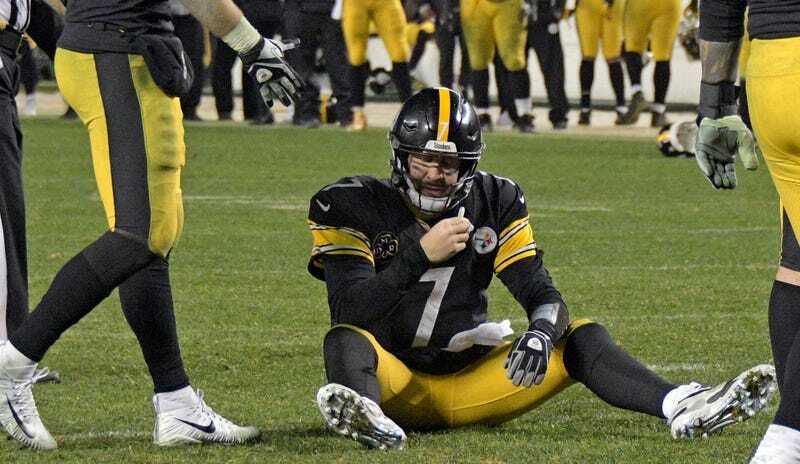 Ben Roethlisberger revealed that he expected to spike the ball, and was overruled. “At that time, everyone thinks it’s getting clocked, so you don’t have time to try to get everyone lined up,” he continued, explaining why the play looked like a fake spike. Roethlisberger said he alerted Eli Rogers with a nod that the play would not be a spike, but apparently no one else. You can see that on the replay—everyone else just stands around confusedly. Just one Steeler receiver, Rogers, even went into the end zone, leading Roethlisberger to jam a throw into coverage. Maybe things work out differently if the Patriots’ secondary was forced to cover more than one person. Maybe the ball should have been thrown away rather than into quadruple coverage. Or “maybe I should have clocked it,” Roethlisberger said. The defense was not fooled—meaning way more Patriots than Steelers expected Pittsburgh to run a play. Multiple New England players said they see fake spikes all the time in practice, and both defenders in on the interception—Eric Rowe, who deflected the ball, and Duron Harmon, who caught it—had watched the Steelers run it before. “I was like ‘Oh, they’re running the play,’” said Rowe. With all the context, I still don’t have a problem with the Steelers going for it. Fortune favors the bold, and too often NFL coaches are too scared of failure to do something unexpected. But the execution was piss-poor. With all the down time during the replay review two plays earlier, the Steelers coaches should have prepared everyone to run a play in that situation, rather than making that decision on the spur of the moment, with not enough time for everyone to be alerted. And the ideal play would not have been a slant route; it would have been a fade, or anything where an incompletion would be likely to result from good coverage, and given the Steelers the chance to kick a field goal anyway.